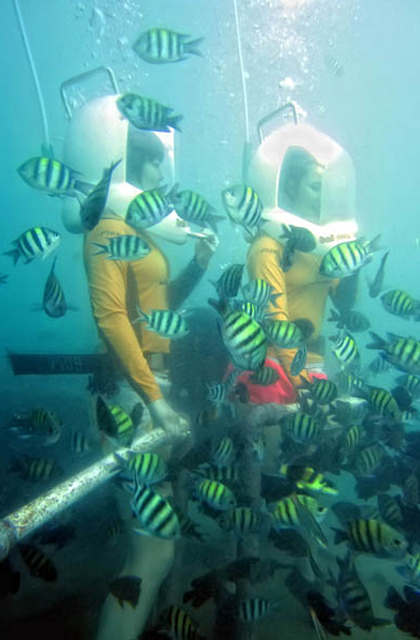 The Ocean Walker is a popular activity in Bali, where visitors can dive to the bottom of the ocean, even while wearing glasses or contact lenses. Visitors wear underwater helmets, enabling them to have great fun exploring the bottom of the sea, whether they are beginner swimmers, non-swimmers, children, or elderly people. Get up close to corals, tropical fish, plus many more beautiful natural wonders that are truly unique to Bali. 30min Bali Ocean Walker, Instructor, Boat, Locker Room・Shower, Boots, Insurance. We recommend to check availability beforehand by yourself. For safety reason,this activity is prohibited for persons with these conditions, pregnant, heart disease,respiratory disease, arrhythmias, otorhinolaryngitis infections and people with claustrophobia, etc. Every day the start time is 10:00-14:00, there is a possibility that the performance time will change depending on the ocean condition, there is a possibility of unable to perform etc, so we recomend you inquire to BMR directly in Advance. Please arrive at least 15 minutes prior to the time schedule. You can rent a towel.